Located on the eastern shore of Lake Washington at the western edge of Bellevue on the opposite shore from Seattle, Medina has a reputation for being one of the most desirable communities not just in the Puget Sound, but the entire nation. 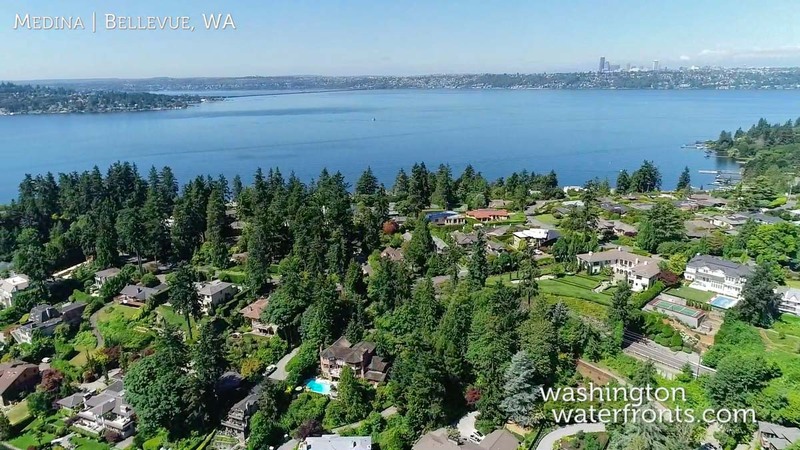 It’s home to residents like Microsoft founder Bill Gates and Amazon founder Jeff Bezos and other highly affluent citizens, with waterfront mansions along its shoreline. Despite being so close to the city, Medina waterfront real estate has a very tranquil, secluded feel, uninterrupted by through-traffic. In this lakeside enclave that was incorporated in 1955, you’ll find a very rural feel with few traffic lights or sidewalks, and many of the largest homes out of sight. Medina waterfront real estate means being able to bring all of your toys and then some for immediate access to Lake Washington, while being able to easily travel to a wide range of destinations throughout the Seattle area. The Medina Grocery store makes it easy to pick up necessities just steps away, while world-class dining and shopping awaits in nearby Bellevue. Medina waterfront real estate is home to some of the country’s most exclusive properties, including magnificent mansions, surrounded by beautiful garden-filled landscaping, where your private driveway is lined with towering hedges, and your sweeping southern view includes Lake Washington and soaring Mount Rainier. At water’s edge, perhaps you have a rock-enclosed lake splash pool, and of course, your own dock with deep water moorage. Look forward to listening to the waves as the gently lap against the shoreline, and gazing at glorious sunsets over the water as the sailboats pass by. Medina waterfront real estate truly offers it all when it comes to waterside living for those who are looking to enjoy the good life and then some. Take advantage of our industry-leading tools to make your property search as easy as possible and be sure to register for a FREE account so that you can receive email alerts whenever new Medina real estate for sale hits the market. If you’re seeking to sell your Medina property, contact our Waterfront Specialists directly for a comprehensive listing analysis and to learn more about the cutting-edge marketing strategies we’ll use to sell your home quickly for top dollar!